As the popularity of sport continues to boom across the globe, so too does the interest in pursuing a career linked to our favorite past times. Coaching, athletic training, front office personnel, and you guessed it, strength & conditioning/athletic development, have all seen meteoric rises in popularity among young adult choosing a college major and career path. Unfortunately, the number of people interested in the field compared to those who actually earn a living in it is quite unbalanced. So, why do so many individuals get turned off to these career paths and change their route altogether? That answer is complicated and multifaceted, but perhaps the most simplified response is that there simply aren’t enough jobs to satisfy the overwhelming demand. Because of this imbalance, it is very difficult for mediocre coaches to land a good job and stay employed. And, when the going gets tough (because it absolutely will) the pretenders often get going… on to a different career. To begin a career in the word of athletic development, whether it be in the high school, collegiate, professional or private sector, a hopeful coach typically has to go to lengths above and beyond what is required in other fields just to land an entry-level position. Unlike other majors, there aren’t any “exercise science job fairs” just before graduation where we land our dream jobs. This alone is a turn-off and exit sign to many hopeful S & C coaches. Essentially, many strength and conditioning hopefuls finding themselves out of the game before they even started. Internships, clinics, conferences, apprenticeships, and more free hours worked than many prisoners locked away in a penitentiary, are all commonplace for young professionals in hopes to land a graduate assistantship, and then possibly if all goes well a full-time job. Much like life, nothing is promised in the world of strength and conditioning. Many things can go wrong along the journey to achieving one’s dream job. I’m not here to paint a picture of doom and gloom, or to scare you off into another career. Instead, I’d like to let you know that you’re not alone, and offer you my story as a way to inspire you to persevere through difficulties. The road hasn’t been easy for me. While your path won’t necessarily be the same as mine, I feel like my experiences may be able to help you to land your dream job in athletic development. I certainly haven’t had the most conventional career path, but as I reflect on it, I realize that things have fallen into place for good reasons. As I began my journey into S & C, the question I heard over and over from coaches, mentors, and speakers was “What’s your Why?” Three words can essentially define your entire motivation to succeed. My why was first discovered immediately after my high school sporting career had finished. I was in incredible shape after the last wrestling meet of my life, and I felt that I wanted to stay that way. I also need to fill a void that now existed in my life. Being active my entire life, the decision was easy, and I decided to start lifting weights. Even as an ignorant teenager who sought out muscle magazines for guidance, I was able to see results quickly and I was hooked. I also became a little bitter wondering what could have been if I had begun weight training years prior. My high school had an abysmal “weights class” that’s probably similar to many people’s experiences. We’d basically go into the weight room with no guidance and wait for the allotted time to expire so we could all go home. It finally hit me that I was ripped off by not having a solid program in place. I immediately thought about pairing resistance training with sports, but I had no idea there was actually a career path for this. I quickly realized that my why was to be the person I wished I’d had when I was younger. I eventually attended college at Central Michigan University and began my path toward becoming a performance coach. After discovering that “Athletic Training” wasn’t actually learning about “training athletes” (they really need to come up with a better name) I was left incredibly frustrated and 2 credits at about $750 was wasted in my foolish attempt to take classes to become a “trainer.” Luckily, an instructor explained the difference, and I was able to start moving in the right direction. My program was mainly designed for cardiac rehab or for those heading to PT or PA school. I started to wonder if there was a different option when I was told I should look into the “personal training” minor. There was no mention of anything related to strength & conditioning. We had an internship supervisor, so I eagerly set up an appointment to try to find any experience in the field that I could. I was actually scolded for trying to find an internship before it was time to graduate and that I had better not seek one out until that time. I was absolutely dumbfounded and discouraged, but I refused to settle. I listened to my gut, and my first big break came shortly thereafter. My first break came when I applied for a scholarship for 1st generation college students. During a meeting with my advisor, I explained what I wanted to do for a living. She had no knowledge on the subject, but she referred me to Dr. Roop Jayraman who listened to my career goals and stopped me in my tracks. You see, I was applying for a scholarship that would lead me to a free Ph.D., when I told him that I wanted to “train athletes.” He very kindly told me this scholarship probably wasn’t what I wanted, but he referred me to his friend Jim Kielbaso at a place called Total Performance. He showed me the website and I felt like I struck gold because the training center was located a mere 10 minutes from my hometown. He gave me Jim’s contact info and set up an interview for a summer internship. That summer changed everything for me. I ended up doing a totally volunteer internship at Total Performance Training Center with Jim during the summer before my senior year, and it was exactly what I needed. I finally found what I had been looking for. It went well enough that he invited me back to work as a part-time employee whenever I could get chunks of time away from college. At the time, CMU had a very short list of internship sites for those entering the fitness field. So, I chose to spend my post-education “required internship” at Total Performance since it was the only place that offered what I was looking for. When my time at Total Performance was nearing an end, I was admitted to graduate school as a teaching graduate assistant at CMU where I would help teach labs for health fitness classes. I accepted the position, and this experience really helped me hone my knowledge of exercise principles, anatomy, physiology, and biomechanics. Sure I had studied these topics before, but I firmly believe you truly understand a concept when you have to teach it. I couldn’t fake it in front of the class, and I began to get more comfortable with the science and application of exercise. It’s not what you know, or even who you know. It’s who knows you. Nearing the end of my first year of grad school I had two unique opportunities present themselves. Option one actually involved going on tour with the “Vans Warped Tour” rock festival. Option two was applying for an internship with the University of Michigan football team. Jim Kielbaso knew the coaching staff at Michigan and trusted me enough to pretty much get me the phone interview that secured the gig. He also pushed me toward this option even though being on a “rock tour” sounded pretty awesome at the time. I know this is the case because I was told by my boss at Michigan (and now one of my mentors), Mark Naylor, that my resume looked terrible. But, because Jim vouched for me, I got a chance and was welcomed aboard at Michigan. (HUGE lesson learned here in building a resume which will be addressed later on). It was at U of M that I realized exactly where I wanted to do; I needed to be in a collegiate weight room. (Lesson in interning as much as possible to find out what fits you best in the S&C world). As my time at Michigan was nearing its end I was preparing to return to CMU for my last year of grad school. 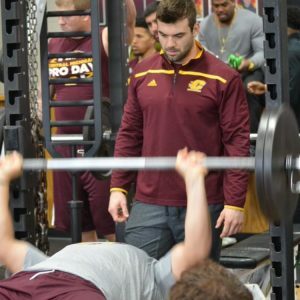 I had done a good job, and Coach Naylor made it clear that in order to stay alive in the field I needed to find a way inside CMU’s weight room and become a part of the football program. CMU had undergone a coaching change and hired new S & C coach, Jason Novak. Jason had come to CMU after 11 years in the NFL with the Tennessee Titans. Coach Naylor did not know Coach Novak personally but had common connections. A former U of M player who now plays for the Titans happened to be the connecting factor. It turned out that a football player who didn’t even know my name helped get my foot in the door. It once again came down to not what I knew, but who I knew and who knew me. I interviewed for a graduate intern position and before I knew it I traded in my Maize and Blue for Maroon and Gold and was able to become a part of the strength staff at CMU. During my interview with Jason Novak he said something that will stick with me for the rest of my career. He told me he was given some incredible opportunities as a young coach and felt lucky to have some people along the way who simply gave him a chance. He also encountered those on the opposite end of the spectrum, and he had vowed to himself that he would help those out just as he was helped out when he was young. I swore to myself that when I was in a position to do so I would do the same. It’s something that I’m grateful for and just one of the countless reasons why I admire Coach Novak so greatly. I spent the entire second year of grad school taking classes, teaching classes, and spending any free minute helping train the football team. I counted as one of the 5 strength coaches associated with football, which meant I could full-on coach and be with the team on the sidelines of games. It was a taste of exactly what I wanted to do for a career and it only strengthened my appetite to make it in the S & C field. At the end of that year, I found myself finished with school, a masters program in hand, and no full-time coaching job lined up. This was a pretty difficult time for me because I felt like I had done everything I was “supposed” to do and things just weren’t happening. Fortunately, there was an opening as a fixed-term faculty in the school of health sciences and I was offered a semester-by-semester contract where I taught undergraduate classes and a lab for the physical therapy students. While it wasn’t a full-time S & C gig, it allowed for me to continue working with CMU football so I embraced the opportunity with optimism. During this year, one of my colleagues at CMU got his big break and became a full-time coach at Florida International University. His good-fortune proved to be a turning point for me as well. Since our staff was now shorthanded, I began getting compensated for being a strength coach as well as seeing my role in the S & C department increased significantly. My time at CMU eventually evolved further than even Charles Darwin could’ve foreseen. I began as a confused undergrad who spent $750 on a course that focused on taping ankles, to being a “professor figure” and coach at my alma mater. Life was pretty good, so I spent another year at CMU. In doing so I became a fixture in the health fitness undergraduate program, teaching and helping students in the very same situation I found myself in just a few years prior. I loved my dual role teaching and coaching, but I was burning the candle at both ends. I was putting in countless hours, working for peanuts, and it started to get to me. I missed out on several opportunities before I was finally able to hit pay dirt and catch my biggest, most unlikely break yet. I interviewed for a job at Utah State University and ended up being offered an assistant coaching position with strength coach Dave Scholz. I accepted it and suddenly found myself saying goodbye to those I loved and cared for most to take an opportunity 1600 miles away. I packed up everything I could fit in my Toyota Corolla and traded in the great lakes for sprawling mountains. My life was flipped upside down, but as crazy as it may sound, it felt so very right because I had been preparing for this opportunity for years. The point of sharing my journey was to highlight some of the moments that changed my life, share some lessons I’ve learned, and to demonstrate that things can eventually work out. You may be struggling to open a business, land a job or make your next big move. Wherever you find yourself, the best piece of advice I can give is never, ever give up. I was told no. I had to blaze my own trail, and I had minimal guidance until I worked hard enough (and was lucky enough) to find it. My journey is far from conventional, but with persistence, pride and passion for everything I did, I was able to make it work. There is no set “way” in this profession, rather there is a set of intangibles we have in all of us that will serve far more important than a resume ever will. The funny thing is that if you understand that last point and work harder than the person next to you, the resume and references will have a way of filling themselves out. In the next installment, I plan on sharing more about the lessons I’ve learned and some of the things I wish I could have done differently. Until then…..